Posted February 15th, 2019 by Mobile Music School & filed under Benefits of Music Education. 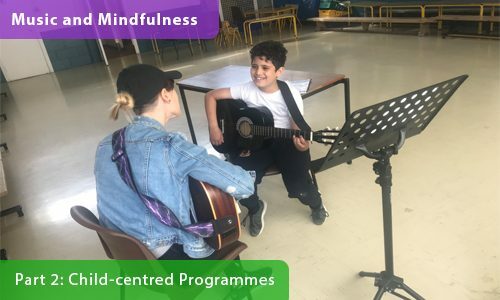 Part 2 of our Music and Mindfulness series will explore the importance of child-centred programmes when learning a musical instrument. Last week we talked to our guitar tutor Zoe about encouraging students to de-stress from school through music. This week we will delve further into the secrets of achieving mindfulness through music with child-centred programmes. Here we get an inside look into our after school guitar lessons with MMS tutor Zoe and our student Abraham. Abraham had little to no English when he began his music lessons and now he’s learning music through English fluently! We believe our child-centred approach helps students to relax and enjoy the learning process. These one-on-one after-school guitar lessons are a great way for students to experience hands-on learning on a weekly basis. Our team of professional music tutors have a unique teaching style that adds a very important personal touch to each music programme. This child-centred approach to learning allows students to relax and focus on music they personally enjoy. Our years of experience has found that creating this open, non-pressurised learning environment is key to supporting mindfulness through music. Music and Mindfulness – Part 3: Going Your Own Direction coming next week!